You might think that if your website is working fine at the moment, “why do I need to update it?”. Isn’t that just increasing the risk for something to break? What if you’re not interested in those new features in the next update version? What if you just don’t have the time? Well, the biggest reason you do need to apply those WordPress updates is, Security. WordPress Updates are important for security. WordPress is currently powering 30.5% of CMS based websites on the internet. The next CMS after that is Joomla at 3.1%. So as you can see, WP is the popular choice, and being such a large slice of the pie, also makes it a big target for hackers/spammers and the like. WordPress is also Open Source, which means that the code-base is fully available for anyone to study, including the bad guys. Fortunately for us, we have such a great community of WordPress experts among us that regularly scan the code for bugs and holes and responsibly report their findings to the WordPress Core team. Depending on the severity of the issue, the Core Team will work to verify the vulnerability, collaborating with other parties, such as security teams from other CMS’s or hosting companies if necessary. 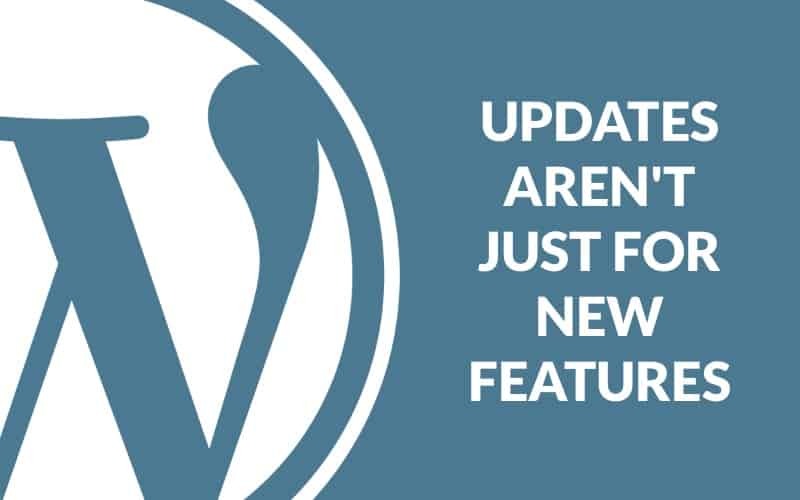 If the issue is severe, a security release update will be pushed out immediately, otherwise, the fix will be included in the next scheduled release of WordPress. Once a security release is made available, it will also include details of what the security issue was and how it was abused. Which makes it even more important to apply these updates straight away, before even more of the bad guys catch on. WordPress’ plugins and themes have the same vulnerabilities, if not, more. As most of the time, they are only written by a single person or small team, so the chance of something slipping past the developer is greater. Or when they are made aware of an issue, it could take them longer to resolve it and release an update due to fewer resources. When choosing themes and plugins for your site, it is a good habit to get into, to always check the user reviews and update frequency, so you know the developer regularly maintains their plugin/theme. Also checking the support ticket section is good too, so that you know if they are responsive to issues or not. So what are you going to go and do to your website now?